Follow me on Twitter or Facebook to stay up to date with the development of SonicWeb. SonicWeb is an advanced internet radio player and recorder. With SonicWeb you can choose from more than two thousand thousand free, hand selected, high quality internet radio stations. The radio station database contains only stations that play music in high audio quality. If you are missing a radio station you can add it yourself or let me know and I will add it quickly. Record internet radios continuously or record multiple stations simultaneously and let SonicWeb split the recorded streams automatically into tracks. Timeshift internet radio: while recording pause and resume playback at any time, without any gaps. Fine tune the start and end of tracks if needed before you export them using any app that supports the iOS share sheet like Dropbox, Weafo or Transmit for iOS. A station list can contain up to 10 internet radio stations. If a station list is turned on SonicWeb will start recording the contained radio stations simultaneously, automatically split the streams into tracks and add them to a combined playlist. Station lists behave exactly the same as regular internet radio stations except that their playlist will contain a mix of songs from the internet radio stations that are part of the station list. 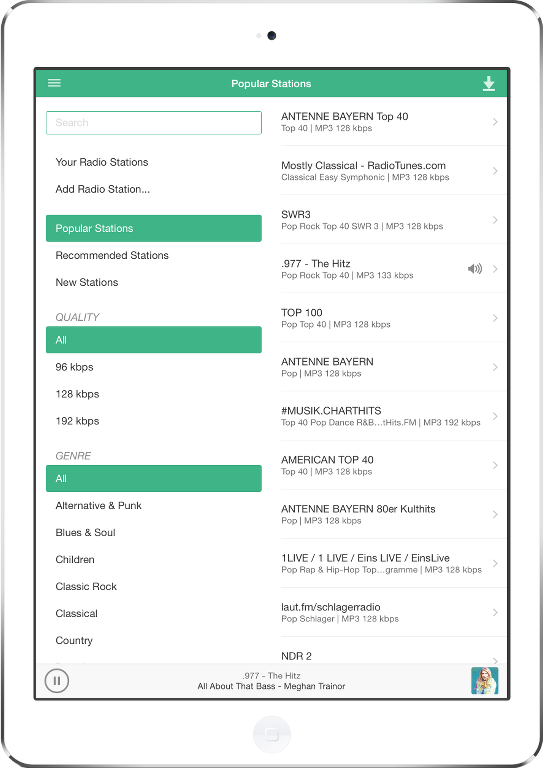 You can define as many station lists as you like and switch between them and regular radio stations at any time. With several simultaneously turned on radio stations the playlist will quickly contain many unplayed tracks. This enables you to skip tracks you don't like without any skip limit as long as there are more tracks available in the playlist. Never worry about a reliable internet connection or your data plan again. Offline listening is perfect for areas with a spotty internet connection. SonicWeb monitors if a WiFi internet connection is available and automatically pauses and resumes streaming and recording. This happens completely transparent without interfering with your listening experience. You can simply continue to listen offline as long as there are more songs available in your playlist. After a WiFi internet connection becomes available again SonicWeb will resume streaming and will continue to fill your playlist with new tracks.